yourtown draw 482 is now finished, there is now a new prize home, yourtown draw 486. Which is a brand new home valued at $1,695,293. Ticket's do sell fast, so be sure to get in quickly! 29 people voted 3.7 stars. Christmas is a time for cozy family get-togethers, enjoying the company of loved ones as we gather to exchange gifts and toast the year to come. 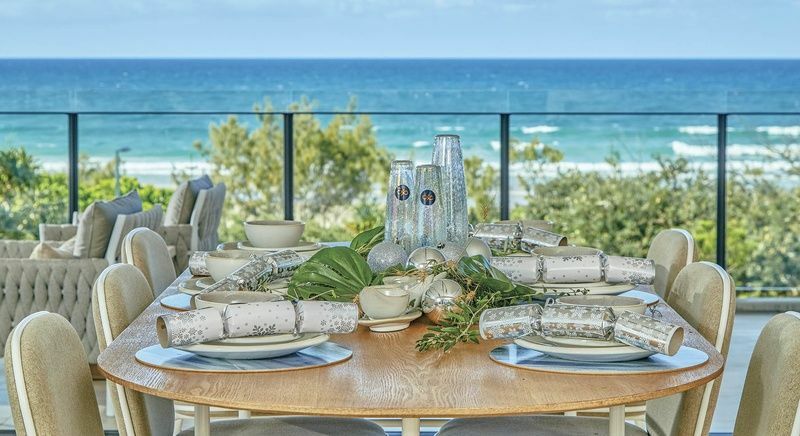 What if this December, you were able to host everyone to a BBQ Christmas lunch on the al fresco of your new home on the Gold Coast? Wouldn’t that be something extra-special worth celebrating? All the prize homes in the yourtown draws are beautifully designed and equipped with luxurious furnishings, appliances and electronics. This final draw of the year, however, brings you something truly out of the ordinary. 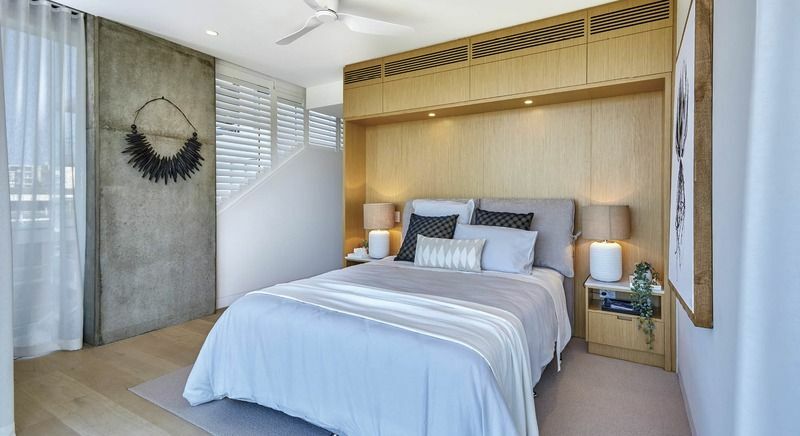 It’s a three-bedroom home in Miami on the famed Gold Coast, and it’s right on North Burleigh Beach. Nothing out the front windows but sand, surf and the vast expanse of the Coral Sea. 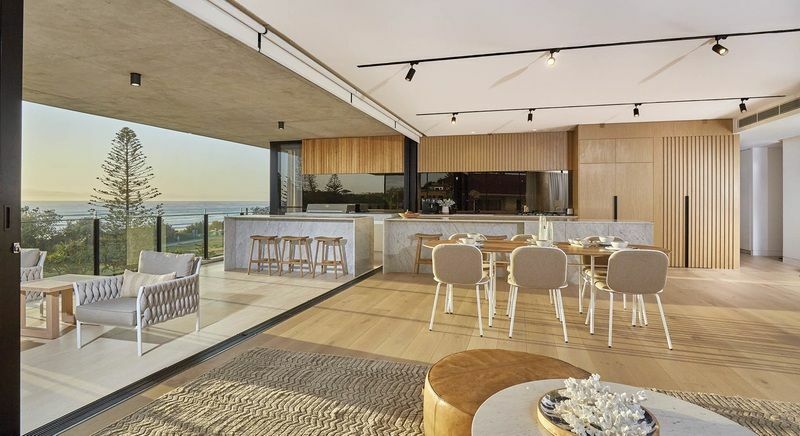 This is beachfront living taken to the next level, in a home that’s been styled from top to bottom by celebrity designer Darren Palmer. Every room exudes comfort, elegance, and a multi-million-dollar lifestyle that could soon be yours with tickets in this once in a lifetime draw. yourtown are limited to selling 500,000 tickets, in draw 482. What is your chance of winning this beautiful home? Along with the spectacular show home, you’ll also get $100,000 in gold bullion to spend any way you please. Fly your family in for the holidays or take that round-the-world cruise you’ve always dreamed of. That could be enough wealth to speed up your retirement plans and make living full-time on the Gold Coast a reality. 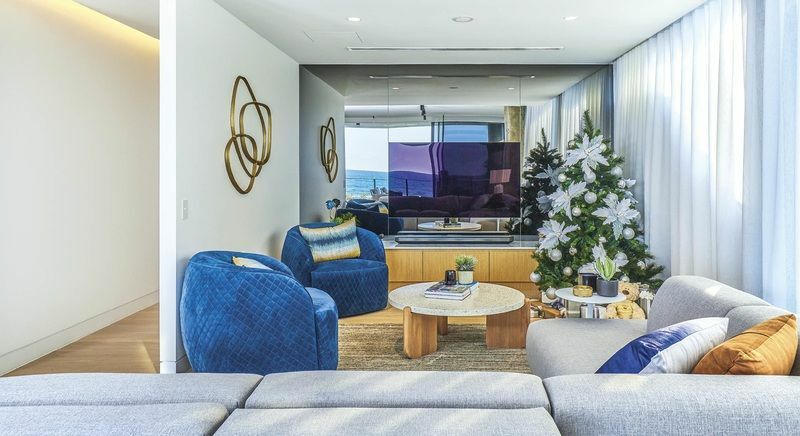 The first prize package also includes a flight centre voucher, over $90,000 in furnishings and electricals, and $1,000 worth of Christmas presents to welcome you to your new home. If you’ve been waiting for just the right place on the beach, this is surely the one. Only 500,000 tickets will be sold so if you want to be in to win, you’ll need to move quickly. Last year’s yourtown Christmas draw was a complete early sell-out, so don’t be caught short this time around. Get your ticket books while they’re still available and start dreaming about a Christmas you’ll never forget. Over half a million people live on Queensland’s Gold Coast, spread along the communities lining the ocean and throughout the surrounding hinterland. It’s a part of the country that’s got more than its fair share of natural wonders, man-made attractions, and special events. 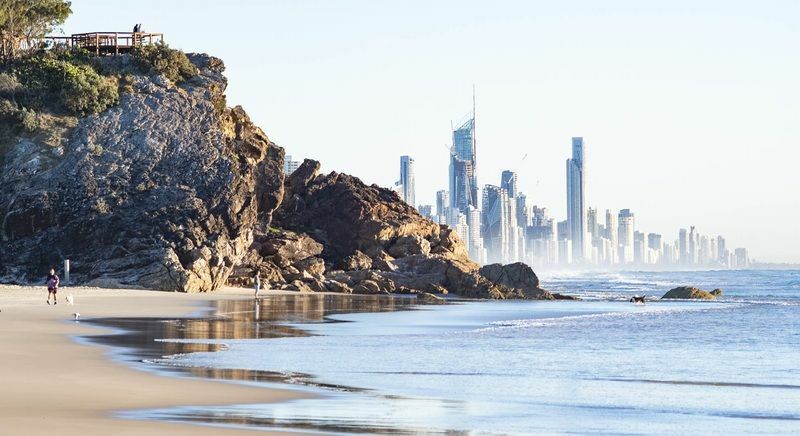 The famed beaches of the Gold Coast run for over 40 virtually unbroken kilometres, from Sanctuary Coast at the north end all the way to Coolangatta on the border with New South Wales. Those beaches are patrolled by over a dozen life saving clubs that keep an eye on the thousands of visitors who flock to the region for the sun, sand and world-class surfing. Each beach has its own character and vibe, guaranteeing something to keep everyone happy. 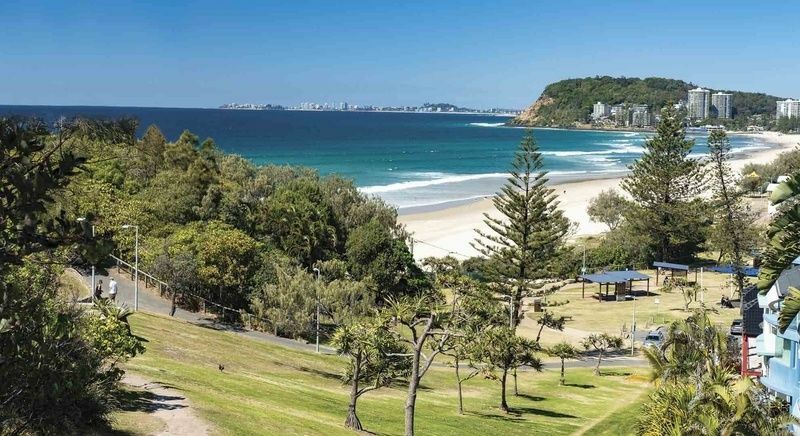 Burleigh Beach has been called Queensland’s answer to Bondi, with great surfing, plenty of places to settle in for a BBQ and a wide expanse of ocean front to throw down a towel and watch the world go by. head south to do a little dolphin spotting in the mouth of Currumbin Creek or test your mettle at Snapper Rocks, the first leg of surfing’s World Tour. If you love a day at the beach, you’ve come to the right place. For something completely different, head for the hinterland. The interior of the coast is several degrees cooler than the beachfront and offers an endless array of walking tracks, charming villages and local produce markets. Lamington and Springbrook National Parks are both UNESCO world heritage sites, remnants of the ancient Gondwana rainforests. This is where you’ll find protected and rare species of flora and fauna along with panoramic views of the coastal surrounds. Stop in for an old-world Devonshire tea or visit one of the many wineries that dot the fertile valleys. A day in the hinterland is always sure to create lasting memories, whether you’re looking to connect with great outdoors or want to explore the varied crafts of the region’s resident artists. The community of Miami is at the southern end of the Central Gold Coast, close to Burleigh Heads and about 8 km down from Surfers Paradise. Holiday bungalows and homes first made an appearance here in the 1920s and the community now boasts a population of around 7,000 residents. Pizzey Park is located in Miami, an open-air sports complex that has numerous fields, an aquatic centre, and skateboarding facilities. It’s also home to several golf courses, a growing café culture, and multiple outdoor restaurants and bars. If you want to shop your heart out with that extra $100,000 in Gold Bullion, the Pacific Fair Shopping Centre is just minutes away. 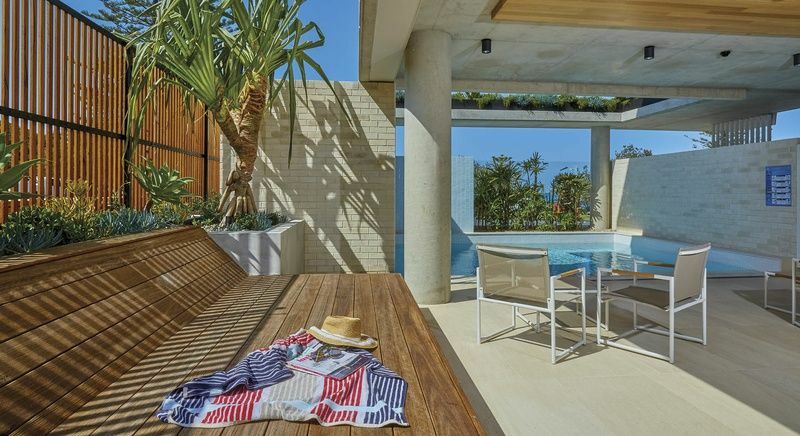 The best part about winning a multi-million-dollar prize home on the Gold Coast is that you’ll have all the time in the world to explore its many amusement parks, vibrant night life and entertainment options. Take it all in at your own pace and retire to your beachfront hideaway after each picture-perfect day. 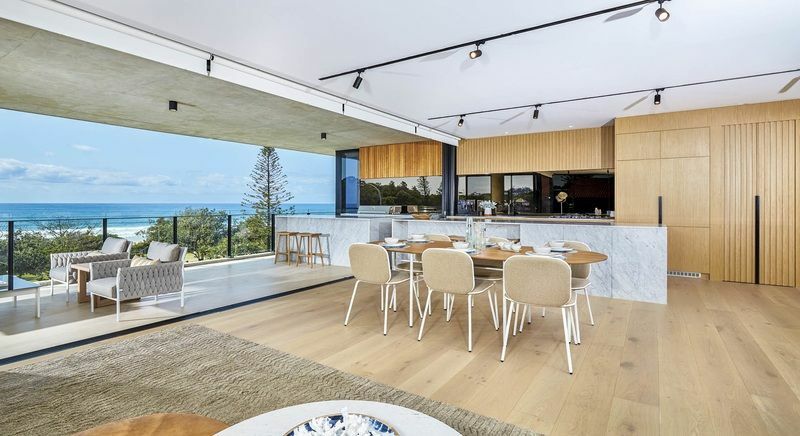 The prize home in draw 482 is located right on North Burleigh Beach. 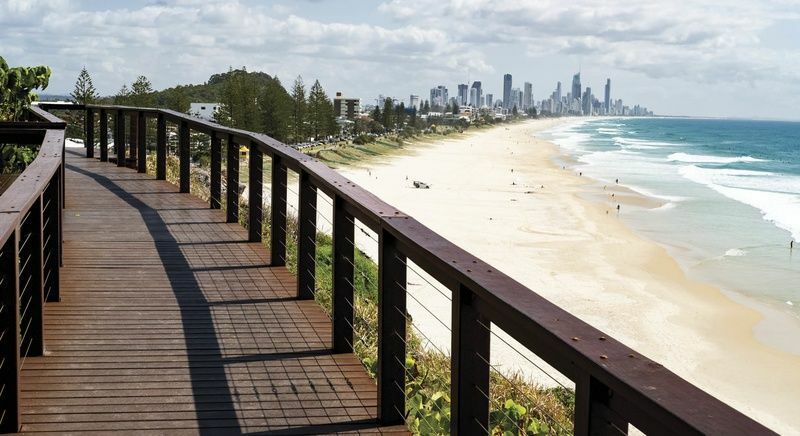 Stroll across the Esplanade and you’ll arrive at the Gold Coast Oceanway, the walking path that lines the beach. After that, its nothing but sand and sea. 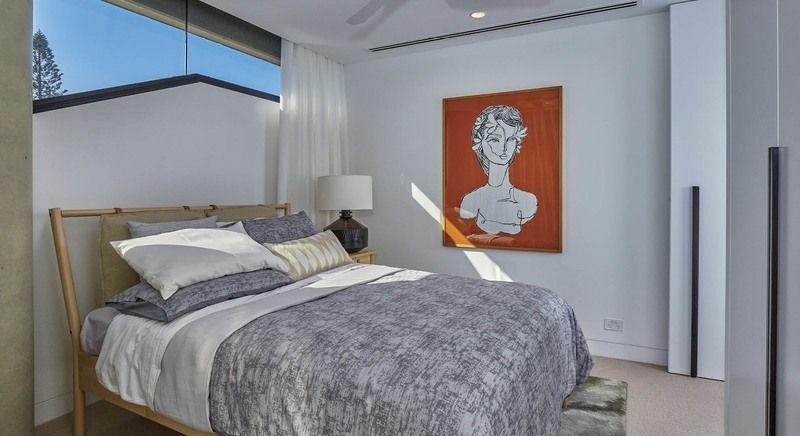 Your home is right beside Mick Shamburg Park, the slight promontory that separates Burleigh from Miami Beach, and Ed Hardy Park is immediately to your right. You’ll be surrounded by natural foliage, boardwalks and an abundance of greenspace. 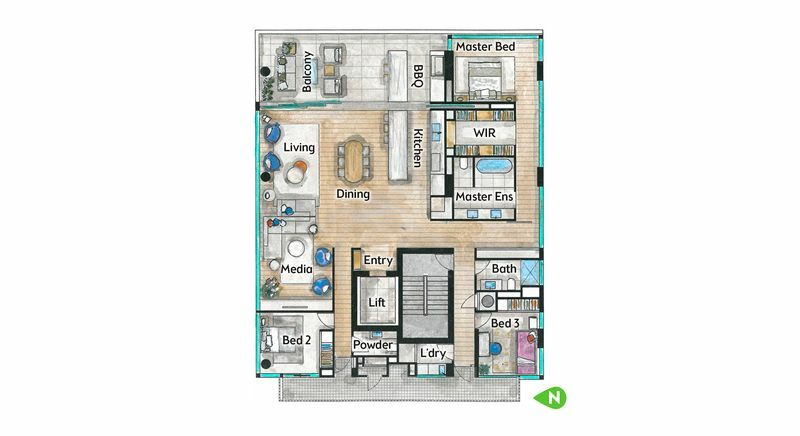 The lift to your floor of an exclusive low-rise building opens onto an expansive central living area. You’ll see the impressive view as soon as you pass through the entry, with the exterior living space blending seamlessly with the interior. 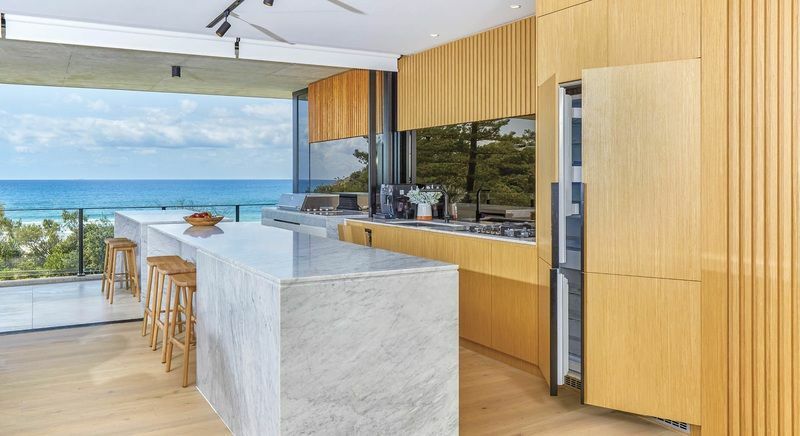 Indoor and outdoor kitchens mirror each other, each featuring soft grey stone-clad islands with stools and sinks. 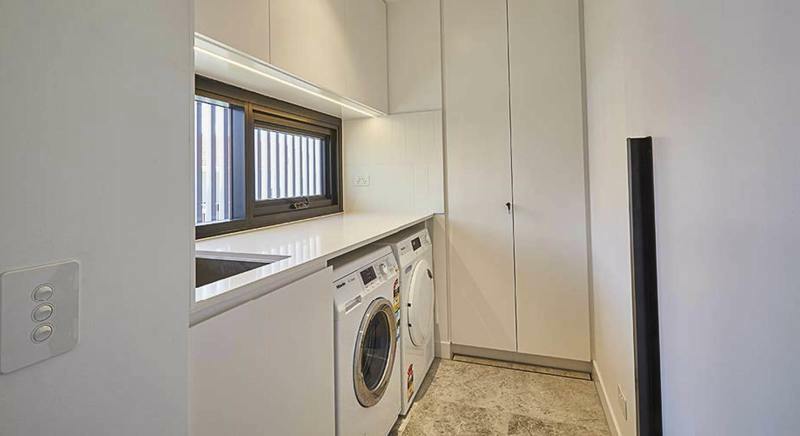 The outdoor galley has a state-of-the-art built-in BBQ while the indoor kitchen comes with cleverly hidden appliances and a walk-in pantry. Both have multiple cupboards, contemporary storage solutions and expansive counter space. 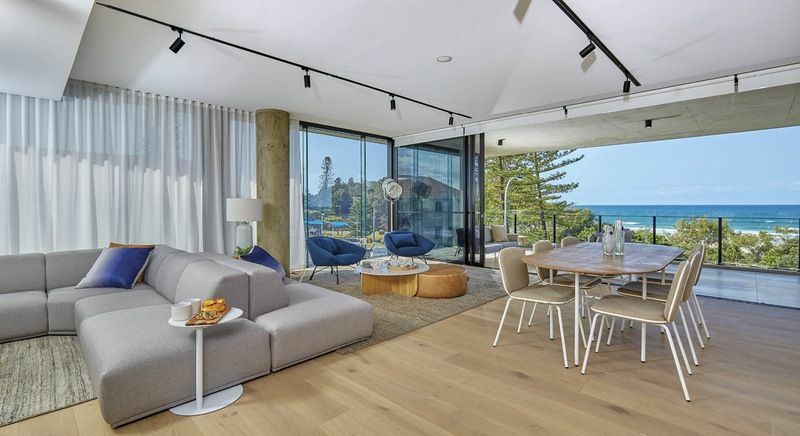 The front balcony of the home has unimpeded views of the ocean and a seating area comprised of two sofas and a low coffee table. This will be the perfect place to enjoy a light lunch, watch the sunset, or curl up with a good book. You’ll also appreciate how much space the balcony provides for entertaining and enjoy the convenience of being able to move easily between the lounge and the al fresco. The most impressive feature of the interior living area is its open and uncluttered feel. There’s plenty of room to seat six at the oval dining table, and room to move in the adjoining living space. A distinctive wrap-around couch separates the front seating area from a semi-enclosed media room that’s got a full entertainment system for your film nights at home. And that’s also where you’ll find a lovely Christmas tree surrounded by $1,000 worth of special presents for the lucky winner of the holiday draw. 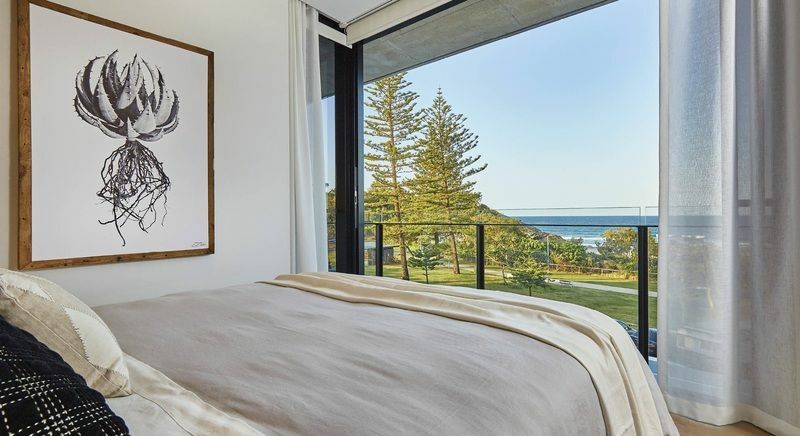 The master bedroom faces the water and with floor to ceiling glazing throughout the residence, your home is filled with sunlight and a never-ending array of breathtaking views. 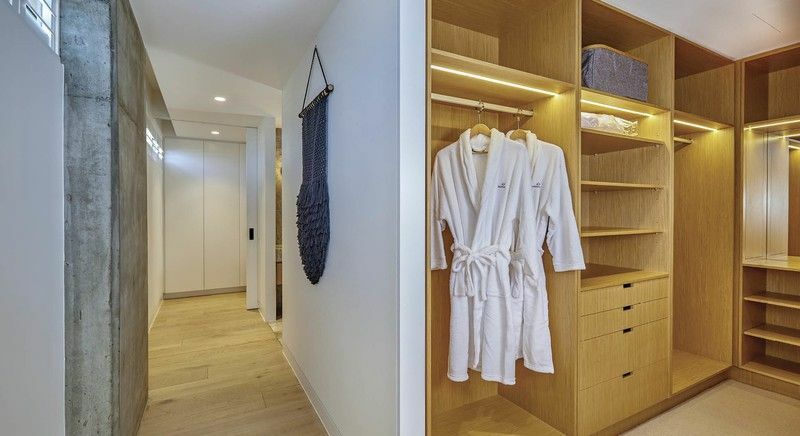 The master suite features a double walk-in robe that even comes with monogrammed yourtown bathrobes. 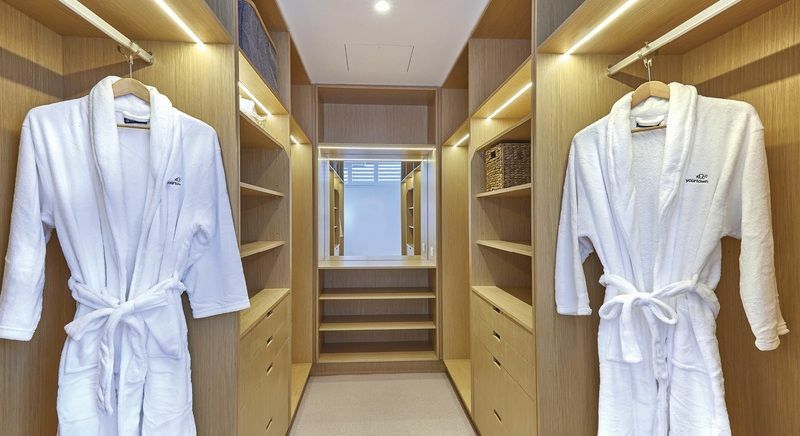 The ensuite has twin sinks, a sumptuous soaking tub and a walk-in shower. 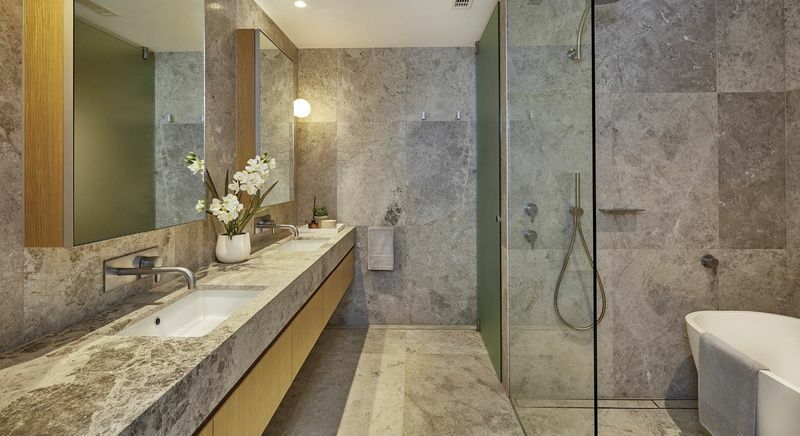 The opulent marbled surfaces span both the walls and floor of this ultra-stylish bathroom. The two additional bedrooms are at the opposite end of the home, separated by the central lift shaft. This gives both rooms ample privacy and each has immediate access to either the second full bathroom or a smaller powder room. 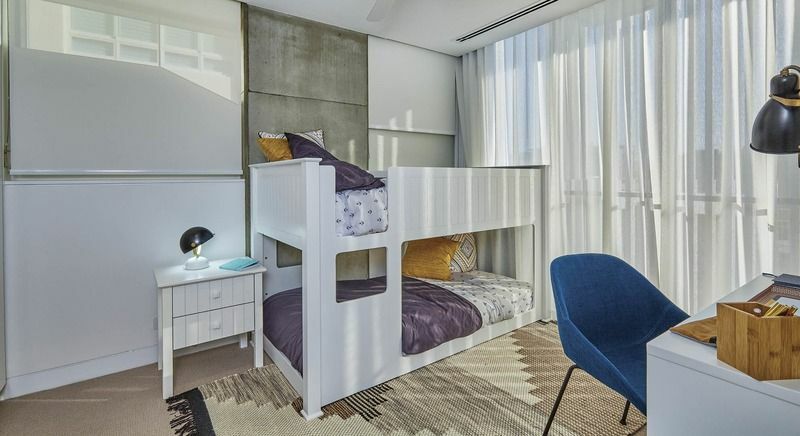 The second bedroom is furnished with a full-sized bed while the third has a custom bunk and small study area. The latter can also easily be converted to a home study if you have need for an enclosed work space. 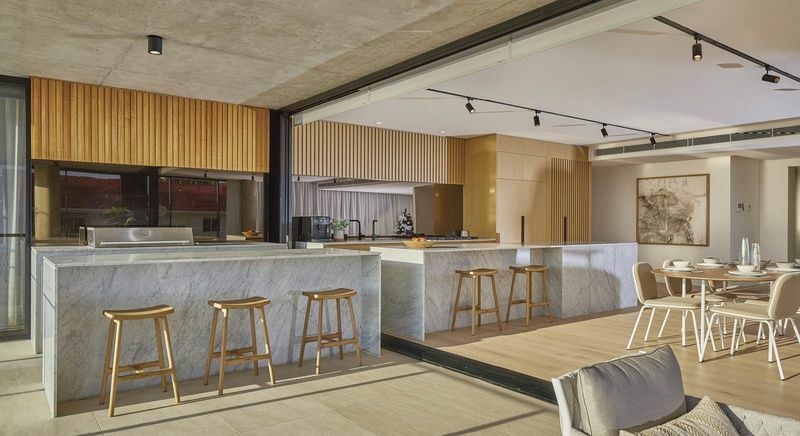 Darren Palmer has created a comfortable, relaxed interior without sacrificing the distinguished look that you’d expect to find in a home of this calibre. Timbered floors complement the soft cream palette that dominates the décor, accentuated by touches of royal blue and muted greys. 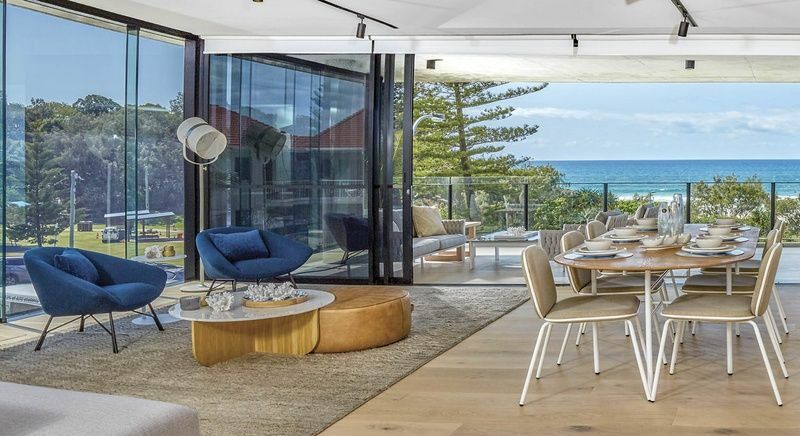 The relaxed ambiance of a beach house meets the opulence of a multi-millionaire lifestyle in a home that captures the very essence of life on the Gold Coast. 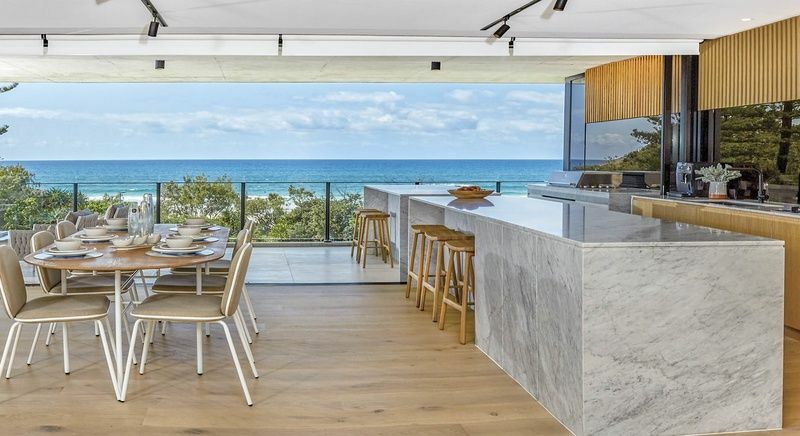 You simply can’t beat the location of this incredible home, giving you absolute beachfront in the heart of the Gold Coast. No corner has been overlooked in an exclusive interior styled by Darren Palmer with over $90,000 worth of furnishings and appliances. Contemporary styling, gorgeous fittings, and the perfect arrangement for stress-free entertaining. 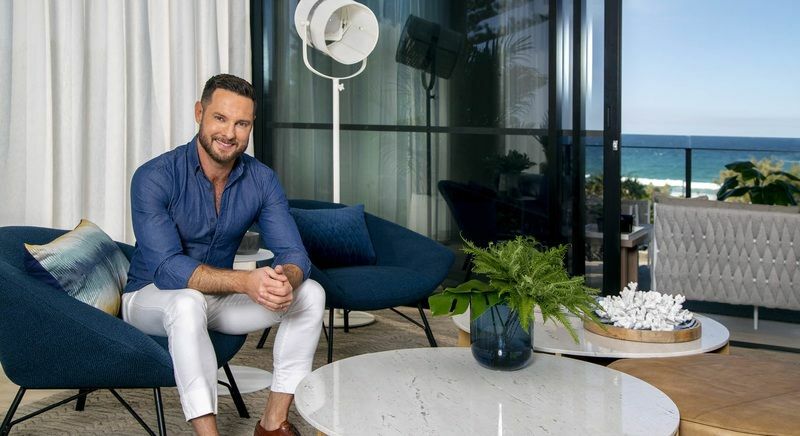 The prize home in draw 482 is a new build, which gave celebrity stylist Darren Palmer a clean slate when it came to designing the interior of this luxurious residence. If you take a tour of the home, you’ll get a unique opportunity to see his work first-hand and get a better understanding of why he’s a household name in Australia. Darren’s career began in designing interiors for up-market clients. From there, he has grown into a trusted expert who continues to provide homeowners, architects and developers with leading products and innovative ideas. He is a brand ambassador, writer, public speaker and event host, perhaps best known for his appearances as an expert judge on ‘The Block’. At heart, however, Darren is an artist whose transformative talents shine in every square foot of the Christmas prize home. Note that Darren was assisted by some talented young people when he was equipping the prize home. They were part of one of yourtown’s Job Training programs, just one of the many services supported by your lottery purchases. 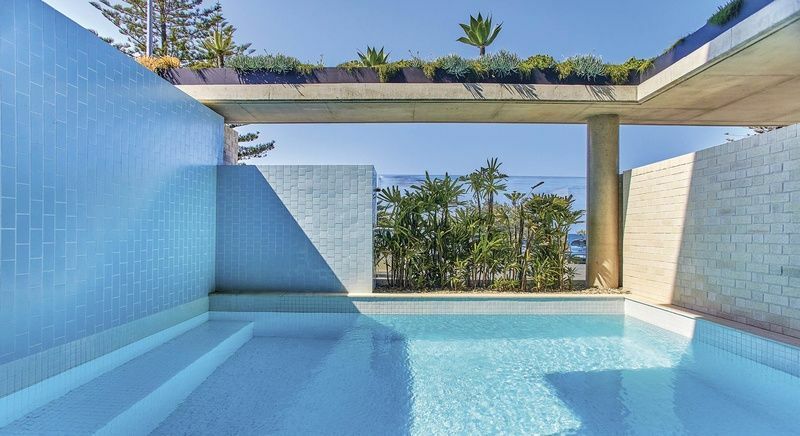 The $3 million prize home in Miami will be open for public inspection from Friday 9 November 2018 until Wednesday 19 December 2018. You can drop by any time between 9am and 5pm, seven days a week. On Thursdays, you’ll get a bonus couple of hours to look around as the home will be open until 7pm. This may be one of the few opportunities you’ll get to see Darren Palmer’s work in person. You can only appreciate his unique flair and artistry by seeing his styling first-hand, and this home is a prime example of the man’s talent. Why not come for the weekend and explore Burleigh Head National Park, walk the Gold Coast Oceanway, and sink your toes in the sand of North Burleigh Beach. Bring your clubs and head for the Burleigh Golf Club or drive a few extra minutes to find literally dozens of greens that will provide you with a challenging round. Take in some of the local boutique shopping and enjoy a fine dining experience in one of the beachside restaurants. It’s never too early to start exploring what could soon be your new neighbourhood! The yourtown Prize Home Draw 482 closes on Wednesday, 19 December 2018 at 10pm AEST. The draw will be held on Friday, 21 December 2018 at 10am AEST at yourtown, 5 Cordova Street, Milton QLD 4064. Members of the public are always welcome to attend yourtown draws, so why not come and catch all the action in person? It’s not every day that someone gets to walk off with a prize package worth over $3 million, and that lucky winner could well be you. Support charity & buy right here! Help us help people in need! Anything purchased on our online store helps people just like you, your family and your friends. Help make a difference in the lives of people in need. 2. We send you your item(s). 3. We donate 50%* to charity. Note: This promotion isn't associated with yourtown, this offer is run by Prize Home Tickets. Winners of draw 482 will be notified of their good fortune by registered mail. You can also find a list of winners published in The Australian on Thursday, 27 December 2018. We will let you know the results of this fantastic Christmas draw right here on our site following its conclusion. Why stop at 12 when you can earn yourself a share of dozens of other fabulous prizes being given away in this monster draw? Beginning on December 1st, youtown will have a daily draw for valuable gift cards and vouchers, giving you even more chances to walk away a winner. 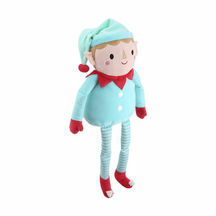 In all, that’s another $14,000 worth of prizes that you could win with your ticket in the yourtown Christmas draw. Get your tickets for draw 482 before they’re gone! Ticket Books Are Selling Fast! We keep telling you to get your tickets for this $3.25 million draw early, and that’s because last year a lot of people were disappointed. The Christmas draw sold out quickly in 2017, and nobody was happy about missing out on a chance to win the most valuable yourtown prize home of the year. There are only 500,000 tickets available for draw 482 and at $15 each, they’re also selling fast. This may be your best chance to become an overnight multi-millionaire, with great odds and even more gold bullion if you purchase a ticket book. By buying as few as two consecutive tickets in the same name (a ticket book) you’ll be adding $20,000 in gold bullion to the first prize package if you’re the lucky winner. Purchase a ticket book with a higher value and you’ll be adding even more gold. 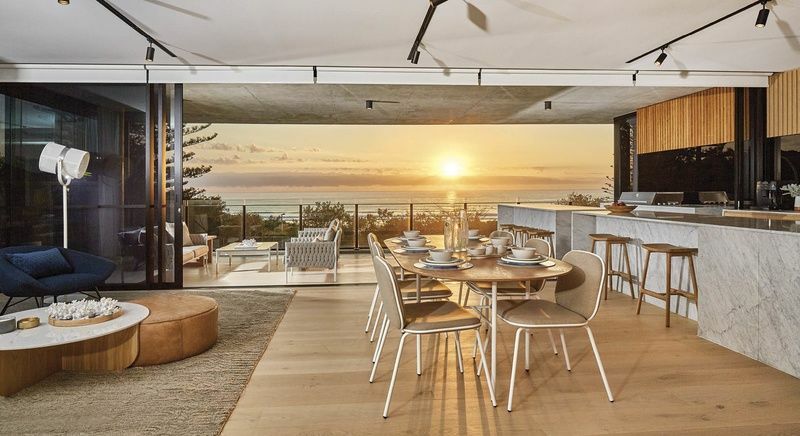 Remember that even if you’re not yet ready to make a permanent move to the Gold Coast, winning this prize home can set you up for life. Whether you choose to put it on the market or keep it as an investment while property values continue to climb, winning draw 482 will make you a multi-millionaire. Yourtown’s mission is to enable young people to improve their quality of life. They believe every young person has the right to a brighter future, and the proceeds from your ticket purchases can make that happen. The organization has been around since 1961 and over the years they’ve helped thousands of young people with issues like mental health, unemployment and domestic violence. They deliver services to young people, employers, parents, carers, and schools, all aimed at helping young people find their place in life. they also provide indigenous specific services and counselling on a whole range of issues that directly affect the lives of Australia’s young people. On behalf of youtown, we thank you for supporting this important work. We wish you the very best of luck in the special Christmas draw and hope you’ll soon be gazing at the beach from your balcony and wondering how to put all that gold bullion to the best possible use. yourtown draw 482 is now finished, there is now a new prize home, yourtown draw 486. Which is a brand new home valued at $1,695,293. Take a look!